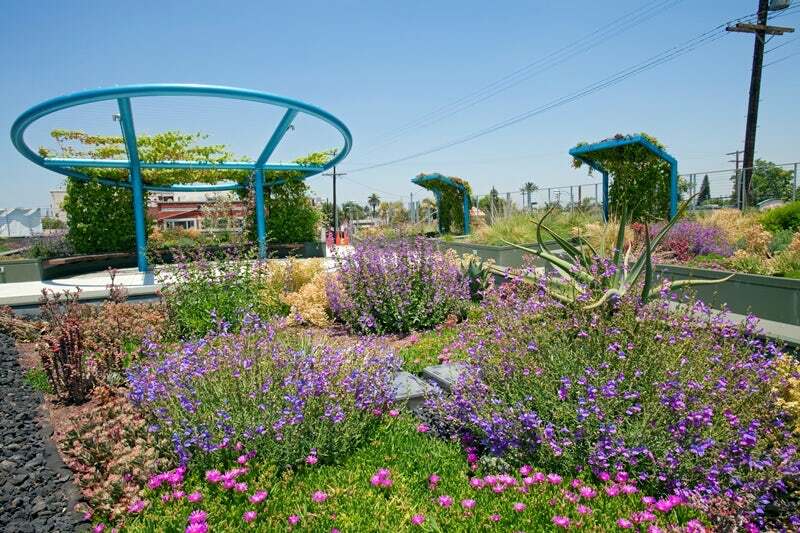 Most water agencies don’t think of local water projects like green roofs or efficiency rebates as assets, but now they can. And that means agencies can now access capital markets for funding, which could help dramatically grow these projects. IN THE YEARS to come, we’re likely to see a lot more “green” and distributed infrastructure projects from water utilities, like permeable pavement, rainwater capture and efficiency rebates. That’s because coming up with the money needed to scale these projects just got a lot easier. In the water world, most big infrastructure projects like treatment facilities and pipelines are usually financed by water agencies selling bonds, which can help them raise millions of dollars for a project that only needs to be paid off a little bit at a time over many years. That’s because these projects are owned by the agencies and are considered an asset on which they can capitalize. But turf removal programs, green roofs and other localized water projects that can have significant impact on water consumption – often referred to as “distributed infrastructure” – weren’t typically considered an asset because they weren’t actually owned by an agency. Instead rebates for these kinds of projects were funded from operating budgets, which often isn’t enough to really scale such efforts. But the Government Accounting Standards Board (GASB), which is an independent organization that establishes accounting and financial standards, approved a policy implementation guide on May 7. This time one of the guidelines it addressed was Statement No. 62 (also referred to in shorthand as GASB 62). GASB 62 has actually been around for years, but it wasn’t well known. That prompted GASB this month to clarify the language around “business-type activities” of public agencies. GASB also refers to these as “regulated operations,” and GASB 62 says that it’s possible for these regulated operations to be considered assets that can be capitalized. While this language may be new to many folks not in the accounting world, what it means in the real world is that many water agencies will now be able to use bonds to fund things they didn’t typically consider an asset before. In particular, distributed infrastructure projects. It’s “potentially a massive game changer,” said Koehler. But for a water agency to be able to capitalize regulated operations, it needs to meet some criteria. It has to have a governing board able to set its own rates and it needs to be able to set rates that are likely to recover the cost of the regulated operation. If a public agency can do that, “the money you spend can be considered an asset and once you have an asset you can bond-fund it,” said Ed Harrington, who served as the controller for the city and county of San Francisco and later as the general manager of the San Francisco Public Utilities Commission until he retired in 2012. This is a big shift for most water utilities, which are used to thinking about fixed things like pipes and pumps as assets. But GASB’s latest guideline is confirming that this practice of capitalizing regulated operations is definitely above board. “This guidance connects the dots from a statement that has existed for some time, specifically to water utilities and how they book expenses for distributed infrastructure,” she said. Now utilities can raise a lot more money for distributed infrastructure projects that they can then pay off slowly over many years, instead of trying to finance projects with cash on hand. That opens up the door to more money for initiatives like cash-for-grass rebates, leak detection devices, rainwater capture, graywater reuse, green roofs, constructed wetlands, permeable pavement, direct installation of high efficiency toilets or fixtures, and smart irrigation control rebates. These distributed infrastructure projects have huge potential. A 2014 report from the Pacific Institute, an Oakland-based global water think-tank, found that there’s the potential to save 3.1 billion to 6.4 billion cubic meters (enough water for 5.8 million to 10.4 million families a year) through efficiencies in the urban water sector alone in California. “Our analysis focused on the savings that could be achieved through more widespread adoption of technology and practices that are available and already in use in California and elsewhere around the world,” the Pacific Institute found.